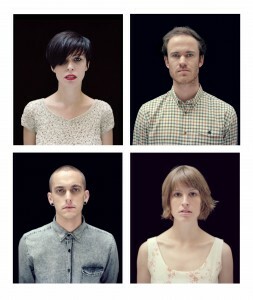 Everyone in Australia (and apparently, most of Canada, the UK and Singapore) knows who The Jezabels are. Dunja Nedic spoke to vocalist, Hayley Mary, last year, and I got the chance to speak to Heather Shannon about their recent travels, coming home, and get a little bit of insight on their debut album, Prisoner. So how’s everything going with the upcoming release? It’s all going really good, rehearsals sound great and it’s actually kind of frustrating to have to put it on the shelf for a little while after all that hard work. I mean, that’s just how it is, but it’s weird to have a break. Did you guys feel much pressure, releasing an entire album? After such a successful run with EPs? Well people would think that there would be a lot of pressure, but it’s actually been alright, kind of used to that kind of pressure actually. With each EP you feel it, and this is essentially just a few more songs, and the closer the release date gets, the less we feel it. I had a look at the press release, and was really impressed with what was said about the story behind the album. This is such a clichéd question, but how does that evolve? It’s actually kind of strange that nothing really had to happen, it’s kind of the same process that we took to all our song writing, just the four of us and Lachlan, our manager, in a room for 6 months. Just talking about ideas. Intuitions. Feelings. And we toss things around, look at the varying concepts and see how it develops. You guys have been, well, almost everywhere over the last little while, can you tell me one, or a few of your favorite moments? Wow, well firstly, it had to be when we first got to Canada, it had just started snowing and I had never seen snow before so it was a really special moment to play in the kind of weather. And we only got to spend 40 hours in Germany, but I would definitely love to go back there. How does it feel to be home and soon to be playing for Australian audiences again? Really good! We’re all here in Byron again, and our families are all here, so it’s a good break, and we’re definitely looking forward to playing again, it’s especially nice to be able to play in our hometown. Lastly, what would you be doing if it weren’t music? Well I was studying classical music at Uni anyways, so really, I couldn’t see it any other way! Prisoner will be available in store on September 16th, via MGM Distribution. This entry was posted in Featured, Music and tagged heather shannon, prisoner, the jezabels. Bookmark the permalink.